A good piece of art anchors a room. Audrey Hepburn canvas and Marilyn Monroe canvas art are no different. Despite being associated with “glam” styles, wall décor featuring beloved Hollywood icons is versatile to use no matter your style. Find out tips for achieving a perfectly curated and unexpected look inspired by the decor styles of starlets including Audrey Hepburn and Marilyn Monroe. Sometimes the best designs are the simplest. This charming room is open, airy, and calm—three things that are hard to achieve simultaneously when designing a space. By making use of one large piece, the Marilyn Monroe photo in black and white, this room becomes the stuff of laidback California style dreams. Great BIG Canvas offers more than 200 pieces of Marilyn Monroe art and every single one can be printed in black and white to get a look similar to the one pictured above. These are a couple of our Marilyn Monroe canvas art picks. So often we find ourselves decorating with items from a similar time period. 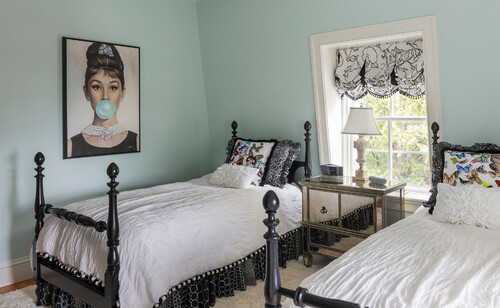 But this room (beautifully) challenges that urge by pairing a playful piece of Audrey Hepburn art with traditional décor. The uniting theme here is a simple color scheme of black, white, and the iconic blue hue Audrey Hepburn is known for. Find more whimsical takes on the modern portrait in the Audrey Hepburn collection. From headshots to movie stills and posters, there’s an Audrey Hepburn art pick for everyone in this glamorous-yet-versatile collection. Find more Hollywood Icon art on Great BIG Canvas!